I didn’t know that the word ‘anthropomorphising’ existed, and therefore I didn’t know what it meant. I didn’t know that people thought it was wrong to assign human feelings to animals. I had what was known as a ‘beginners mind’ (I didn’t know that this phrase existed back then either, or what it meant. I also didn’t know anything about Jane Goodall, who I was later to be compared to, and who I had the pleasure of meeting in person eventually). I wasn’t a scientist, had no desire to be, and never claimed to be. I went to the Island as a photographer, as someone rapt with nature, besotted with dingoes, someone who wanted to learn more about them and take beautiful photos while I was doing so. 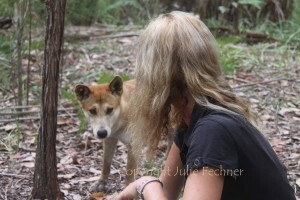 My life became interwoven with the dingoes’ lives. They accepted me as part of their packs. The process took time, and I had to be very patient. How did I do it? By spending hours hiking through the bush, following tracks and trails, scent posts, scats, the smell of dead animals, paw prints, finding thongs, or dairy product containers, and eventually finding a dingo ‘pad’ or ‘rendezvous site’. Then, I used to sit and wait. And wait, and wait. Some days nothing happened, but other days, finally, a dingo appeared. At first the dingoes were wary – but they were never aggressive. I would hear a ‘snuff’ – a quick exhalation of air through the dingo’s nostrils, a sound they make when they are curious about something, or alarmed. The snuff, although quite a gentle sound, alerts other dingoes that are nearby that something is up. Sometimes dingoes would ‘woof’. It is not a bark like a dog, it is a more guttural, diaphragmatic sound than a bark. The woof was also a warning to other dingoes that something was not quite right. It was a warning to me, the visitor, that I was in their territory uninvited. Sometimes, especially with alpha males, the woofing would go for extended periods. The dingoes might circle me at a distance woofing, slowly closing in as they circled until they were within sight of me. During these events, I simply sat still and listened with awe. At no time whatsoever did I use food to lure the dingoes to me. After such displays, the dingoes would leave the area, or else sit down and watch me. I stayed until I felt they had tolerated me long enough. Dingo body language was easy enough to learn, and I always put myself into a submissive posture, so that the dingoes did not feel threatened. I did this with various packs in different areas of the Island and in this way the dingoes slowly came to know me. 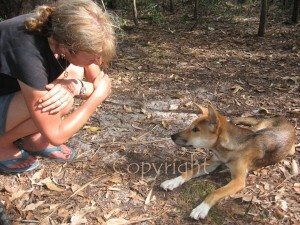 Soon I was able to spend longer periods of time with each of the dingoes and I began to name them. We became friends. They became excited when they saw me and greeted me with wagging tails and big toothy grins. 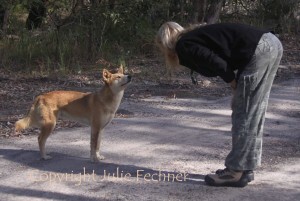 In many cases, once I was accepted into the ‘pack’, the dingoes greeted me ceremonially, like they greeted each other, by rubbing or licking my nose. I always wondered how they knew that a human nose was equivalent to a muzzle. Perhaps they were ‘dingomorphising’ and did not have experts to tell them that humans did not really have dingo feelings. Thus the fairy tale life of living with dingoes began. But so did the sadness. As I got to know the dingo families, their life cycles, whelping seasons, and puppy seasons, I also watched the dingoes slowly grow up and watched as terrible things happened to them. Pups starved as their parents were no longer able to provide for them, due to the lack of food on the Island. Pups also starved once they had been ear-tagged, a process used to identify individuals. I watched as dingoes were hazed from beaches, chased by four wheel drives, I watched as they suffered in so many ways, and I photographed and filmed it all. The most important thing that I wanted my photographs to portray was the sentience of these animals. I had always believed that all animals had thoughts and feelings. They may not have been the same kinds of thoughts and feelings that humans had (though it seems likely that all social mammals have feelings similar to those of humans, and for the same reasons). They certainly experienced and demonstrated happiness, exuberance, affection, love, devotion, loyalty, sadness, pain, grief, and mourning. I was never more convinced of this than when I watched the 2007 litter of my favourite dingo friend Kirra as the pups slowly starved to death. Kirra and her life mate Ronin spent every day out roaming their territory searching for food for their little family. They were scarcely able to bring enough home and both adults became emaciated in the effort. While they were out hunting, I stayed behind with the pups. One particular moment in time is etched in my memory forever. One of the little pups, only three months old, Pepsi, lay dying beside me. She had fought a valiant effort for her life, and had finally lost. I sat beside her talking to her, telling her how sad I was for her, how special and important her life had been, how significant her life was, how relevant. She stared at me with huge liquid brown eyes, listening to every word. Whether the sound of my voice was mesmerising to her, or comforting, I would never know. But what I can say for certain is that it meant something to her. It hit me then, deeper than I could ever describe, how important each life is to each individual, be it animal or human. Their lives matter to them. They care about life. They want to live. They fight for their life. They love their life. Every one of them. No matter what species. It was a profound moment. Each animal is an individual with different characteristics. Look at your family pet. You sometimes think they are human, the way they learn your words, know what you’re asking of them, obey or choose to disobey, play games with you, make up games of their own… no pet is ever the same. So why should wild animals be any different? Why should they have no heart, no soul, no spirit, no personality, no thoughts, no feelings? The dingoes became my friends and I loved them. I loved each and every one of them with their different characteristics. And each and every one of their deaths affected me. My photos showed the sentience in their eyes, the soul behind the mirrors. But they also began to show the suffering, the starvation. 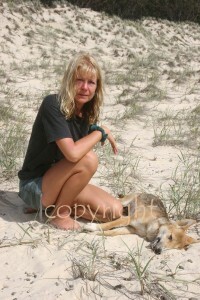 I began to release my photos to conservation groups and also to write stories in magazines about the suffering of the dingoes of Fraser Island. People looked and listened. The evidence was too difficult to ignore. One photo was all it took to convince someone that things were not right over there in the place we called Paradise. The authorities did not want to believe this. The scientists refuted it. The authorities tried to discredit me for their own reasons, which seemed to include their belief that animals are of a different class to us and therefore have no feelings, which gave them a licence to be cruel. They said I wasn’t a scientist so I didn’t matter. They said the animals had no feelings so they didn’t matter either. Living with the dingoes was something that I never took for granted. Each and every day, hour, moment was special and is imprinted on my memory forever. Animals so maligned, with every reason to hate humans, let me in to their lives and let me watch and share in their most intimate moments. I went hunting with them, slept with them, looked after the pups when the parents went hunting, ran through the bush with them, went on territorial patrols, played games with them, engaged in ceremonies with them, and howled when they howled. I shared their grief when a pack member died. Their unconditional love and acceptance of me was profound. The trust they showed me was incredible. We bonded, emotionally. I am writing books about my time with the dingoes, but writing is a very slow process. One day soon I hope my books will be published, and my dream is not to make a lot of money from being a successful author, but to share with the world how amazing our native dog, the dingo, really is, and how very deserving it is of our protection. Hi Jennifer, I have seen native dogs in PNG and Indonesia and Sumatra that are so similar in nature to our dingo that it is amazing. Their appearance is very similar but they are smaller / squatter. They watch, they think, they co-inhabit, they survive. I think their future will be fine.